Prosecutors said multiple witnesses reported seeing 34-year-old Jerrel Turner swing her body from an overhead handrail and kick the elderly woman in the face without provocation around 11:15 a.m. on Jan. 13th. Turner, of the Englewood neighborhood, identifies as female, according to police. Turner exited the train at Bryn Mawr, followed by a witness who trailed her until police arrived. “She kicked an old lady in the face on the train,” the witness reportedly told arriving officers. A second witness confirmed details of the attack, police said, and the victim was able to identify Turner as the attacker. 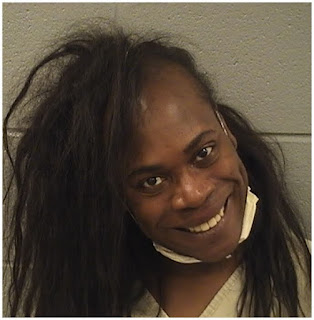 The victim, who lives in Rogers Park, was admitted to Weiss Hospital for treatment of blunt trauma to her forehead, according to police records. Turner is charged with felony aggravated battery of a victim over the age of 60. Judge Stephanie Miller set her bail at $10,000.